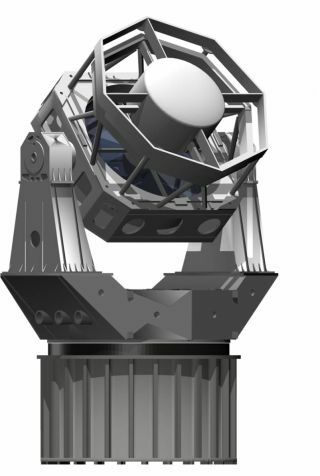 An artist's illustration of DARPA's Space Surveillance Telescope to monitor space junk, micrometeoroids and nanosatellties that could endanger U.S. military satellites in orbit. Satellites that support U.S. military missions around the world can fall prey to collisions with space junk, tiny meteoroids and even enemy microsatellites. Now the Pentagon's DARPA division has begun deploying new ground-based telescopes that can take wide-angle views of small deep-space objects and keep the space sentinels safe. The innovative design of DARPA's telescope can provide the same space surveillance data "in a matter of nights" that existing telescopes require weeks or months to provide, according to Lt. Col. Travis Blake, DARPA’s Space Surveillance Telescope (SST) program manager and an Air Force officer. The telescope's CCD camera consists of curved imagers and a high-speed shutter that allows for both fast scans and high sensitivity. Such sensitivity helps the telescope detect and track the very small, very faint objects zipping across the wide-angle view of space. Besides tracking possible satellite hazards, DARPA's telescope may also provide a new instrument for astronomical surveys of stars and comets. It collected its "first light" images earlier this year, and continues to undergo testing so that it can detect dim objects all on its own. Ultimately, the new telescope aims to find more of the space objects in the geosynchronous region of space around the Earth's equator. That would allow the Pentagon to better keep track of collision dangers for its satellites – at least until the expensive spacecraft get better shields.